Last night I decided to do a little mining in a low sec belt somewhere in the Minmatar Republic in a Procurer. After pulling a load of Glazed Hedbergite, I noticed that I had a level 4 storyline mission, War Materials, waiting for me, with a reward of a +4 intelligence learning implant. I was mining anyway, so why not stock up on Kernite? At 8000 units required per mission, I decided to just mine kernite the rest of the night. I wound up with 37,000+ units of kernite, enough for 4 missions. Considering how often I'm running missions for the Thukker Tribe, that might last me the rest of the year. Then I can go back to mining the good stuff. After turning in the ore and receiving the implant from the agent (worth approximately 20 million ISK), I decided to look at the new activity tracker introduced in the November release. My first reaction was "WTF? I didn't do any mining in high sec!". My second reaction was "Grrr Amarr!". Let me explain. The activity tracker is not tracking where the ore is mined. Instead, the code checks the type of ore mined and classifies the location in that manner. No problem, right? In the Minmatar Republic and Caldari State, the low sec ores are hedbergite and kernite. However, kernite is found in 0.7 systems in the Amarr Empire, so the activity tracker gave me credit for mining in high sec. For those wondering the three ores the activity tracker considers "low sec" ores are jaspet, hemorphite, and hedbergite. 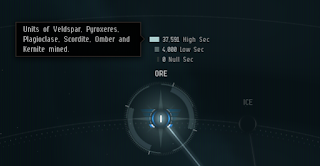 The Amarr and Gallente low sec ores are jaspet and hemorphite. Jaspet is available in all low sec systems while hemorphite and hedbergite are only available in 0.2 security systems and below. That means for those concentrating on the activity tracker, mining in either Minmatar or Caldari 0.3 and 0.4 security systems will not increase the low sec totals at all. Fortunately, I have real reasons to mine in low sec. But I do have to take care in my mission running. With the advent of Abyssal deadspace, I have a need for Thukker Large Cap Batteries. I could just buy them off the market, but why do that when every 16 missions I run for corporations in the Thukker Tribe give me a chance at a +4 learning implant? Last night's mining activity allowed me to finish a storyline mission for the Thukker, boosting me to 5.12 standings with the tribe from Great Wildlands. I'm not sure what good such high standings provides, since I have over 7.9 with both Thukker corporations and I don't trade in Great Wildlands. I do have to take care with my standings with the Gallente Federation. I can get a two-run Federation Navy Comet blueprint copy at 8.5 and I have not redeemed the tags to pick it up. Running storyline missions for the Thukker Tribe slightly lowers my standings with the Gallente Federation. I really should start the Gallente faction grind to take care of getting the faction BPCs from the COSMOS agents in Sinq Laison. Last night struck home the difference between the new activity tracker and the old school ways of tracking activity such as the size of your wallet, standings with NPC corporations, and kill mails. The activity tracker shows a player that he/she did something. The pre-activity tracker measures showed a player accomplished something. In a game like EVE, the difference between the two is important. Star Citizen reached another milestone over the weekend, reaching over $200 million raised. I can't just pass by the event, as we may never see a crowd-funded game reach that level of funding again. I know I should celebrate such a landmark achievement, but I find myself unable to do so. Why? I'm looking at the pace of development so are and wonder if Cloud Imperium Games can finish the game before running out of money. In the history of MMOs, Star Citizen is approaching the costliest game to develop in history. Both Star Wars: The Old Republic and Elder Scrolls Online exceeded $200 million to produce. The only game to theoretically exceed that was Destiny, which is listed as costing between $100-$400 million to develop. Right now, Star Citizen and CIG are in very rarified air. But what has me nervously eyeing the situation and not plunking down cash for a chance to cash in on Roberts-mania is how much work is still ahead of the developers. When evaluating the launch date for Star Citizen, I'm usually overoptimistic. But right now, I would guess at Squadron 42, the single-player game, launching no sooner than Christmas 2020. Star Citizen itself probably needs two more years of Alpha, plus a minimum of one year of beta testing. With that timeline, we are looking at a 2022 launch, although I expect the game to finally launch sometime in 2023. Will Star Citizen fans continue paying $1.5-$2 million a month for the next four years to make sure their dream comes true. Somehow I doubt that will happen. I expect a big compnay, let's say Amazon Game Studios which already utilizes Lumberyard as their in-house game engine, to come in an finish the job started by Chris Roberts. I know that's far-fetched, as a major tech company coming in and rescuing a Chris Roberts game has never happened before, right? 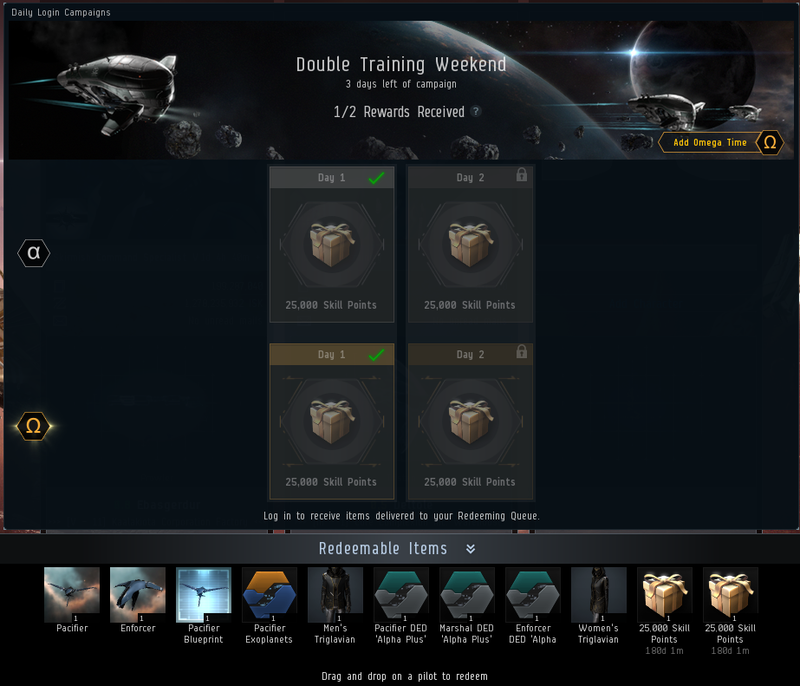 What Does A "Double Training" Weekend In EVE Online Look Like? When I first heard about EVE Online holding its first "Double Training" weekend, I imagined a call between Pearl Abyss' Deputy Director of Western Operations (Spaceship Division) Kim Jong Suit, and CCP WhatNow, CCP's Producer for Innovative Ideas. Kim Jong Suit: Hello! I just came up with a great way to increase your player numbers this weekend! CCP WhatNow: So launching the Onslaught expansion isn't enough? Kim Jong Suit: Of course not! You also need to hold a Double XP weekend. CCP WhatNow: A Double XP weekend? Kim Jong Suit: Yes! Players will be so excited to get extra XP that they will log in and play for hours to get double the XP. And while they play, they will realize all the things they can buy to make their lives easier, and the money will flow through the cash shop. CCP WhatNow: You haven't played EVE, have you? Kim Jong Suit: Of course not! EVE is way too grindy. Kim Jong Suit: It doesn't matter how EVE works! What matters is that Double XP weekends always work. Say, you mean CCP never held a Double XP weekend? CCP WhatNow: No, we haven't. A double-XP weekend just doesn't work in EVE Online like it does in other games due to the way players gain skill points. A character gains skill points just for existing and having a skill in the skill queue. CCP came up with an alternative plan more fitting for EVE. Yes, you do have to log into the client on two separate days, but to get the skill points does not require entering the game world on a character. The skill points are added to the redemption queue and don't expire for 180 days. Honestly, I'm a little baffled by the promotion unless CCP believes that the content released in Onslaught is not enough to attract players back to the game. I get the concern. But I didn't think CCP would try to goose the numbers up in such a fashion. This feels like something someone from Pearl Abyss who's never played EVE would think is a good idea. Because the reason to hold a double XP weekend is to increase player engagement with the game. A promotion that doesn't even require logging a character into the game seems to not qualify. I will admit to some skepticism when CCP announced the Abyssal Deadspace and Triglavian content this spring. The idea of instanced dungeons one had to complete in a set amount of time or die in didn't sound very appealing. Add in the possibility of a gank squad waiting outside the entrance to take my stuff, and I figured I needed to let the novelty of Abyssal Deadspace wear off before running the content on Tranquility. 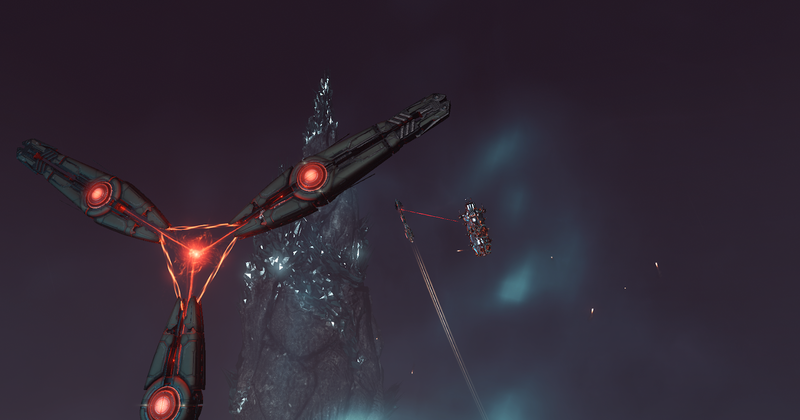 Abyssal deadspace has a lot of good qualities that make the feature the best PvE content I've run in EVE. First, the 20 minute timer introduces a sense of urgency not even present when running sites in low sec. Don't finish the site in 20 minutes, your ship blows up and you wake up in a pod bay. The sites also have boundaries. Unlike the alliance tournament, though, running past the boundary does not bring instant death. Stay outside the boundary long enough, though, and the pressures of the depths eventually crush your ship. Another interesting twist is the sites are procedurally generated. After awhile the different types of spawns become familiar. I do have to admit the remote repping battleships and the battleship that sits at the edge of the site looking to bait unsuspecting players to hurtle outside the pocket were disconcerting at first. No blindly orbiting an NPC an shooting until it's dead. I did that on the test server in the final pocket of a site once and wound up 60 km from the exit gate. A good thing death on Singularity doesn't really count. But I highly advise manually piloting, especially when facing Vedmaks. The Triglavians stop shooting at 23 km, which resets the ramp-up on their weapons. Orbiting an object allows the disintegrator to ramp-up to maximum damage. Death usually follows. The best part is, one never knows what encounters the random number generator will present. Finally, the art team did a fantastic job on the sites. The Abyssal deadspace sites are probably the most beautiful in all of EVE. Sometimes I feel like I'm in the middle of an aquarium, which is fitting for the game's submarine-like physics. At other times I feel like I'm flying though an atmosphere with really great terrain. According to the presentations at EVE Vegas, CCP will use the Abyssal site technology to bring atmospheric flight to EVE for the first time in the upcoming live event in December. Running the Abyssal deadspace sites did require me to leave my comfort zone. For over 8 years, running PvE content meant sniping from long range and signature/speed tank. An effective tactic although I'm sure many will say I'm playing the game wrong. But I never used faction or tech 2 ammunition or modules worth more than tech 2 gear. The goal was to not fly a blinged out ship that would attract attention. With the introduction of Abyssal space, I fly a lot more bling than I did even as recently as a year ago. If I fit a cap battery, I find myself using faction types like Republic Fleet or Thukkur rather than a tech 2 version. Federation Navy 10MN Afterburners are now a staple of any of my ships running Abyssal sites. As for faction ammo? Never use a filament without it. With all the PvE goodness represented by Abyssal deadspace, the big downside is that the average age of players running the content is 5 years. With an eye towards expanding player usage, CCP is adding features aimed at lowering the barrier to entry. The new multi-player option allows lower skill players to climb into a frigate with two friends to run the sites. The patch notes also indicate that CCP has removed all webbing frigates from the tier 1 (aka Calm) sites. In addition, all tiers have had an adjustment on how many NPCs can spawn at once, with tiers 1-3 spawning on average fewer NPCs. CCP is also adding a PvP arena, but that falls outside the scope of this post. Personally, I don't make enough from running Abyssal sites to justify risking my heavy assault cruisers in a fight to the death. But I am getting to the point where I might soon see the profit potential. Through 72 sites, I've grown my initial stock of 3 tier 1 filaments into 28 tier 1-3 filaments and 8 tier 4 filaments. I even went out and purchased a Sacrilege to run the Dark Abyssal sites, the weakness of my Vagabond. I have 450 million ISK worth of drops sitting in a can in a station and sold another 150 million ISK in red loot to NPC buyers. If I don't make a lot of ISK from Abyssal deadspace, why run the content? In my case, I find the content a bit addictive. I sat down at my computer Sunday and a few hours later had run 15 sites. One of the reasons this post came out on a Tuesday is I was too busy playing EVE over the weekend to write. Sure, I got some pretty screenshots, but I don't have a machine in which I insert screenshots and a post emerges. This year, EVE Vegas fell during the period I normally would research live events on the Singularity, so no warning post about how much the Crimson Harvest changed from last year. The third iteration of EVE Online's Halloween event will go down in history as the event in which players first could manufacture cerebral accelerators. For those unfamiliar with EVE, think experience potions. In other games, XP potions are either found as drops, or more commonly, purchased from the cash shop. The idea of craftable items isn't new, though. Black Desert Online, for example, allows players to make food and drink that grants XP boosts. CCP divided the content into two types of instances, Crimson Gauntlets and Crimson Harvest Fields. The Crimson Gauntlets were the combat instances that dropped the good loot. I only ran the sites in high sec because I didn't really have a lot of time to play until Sunday and didn't have time for the interruptions I'd have running the content in low sec. I wish I had run the sites in low sec, as the drops even in high security space were pretty nice. I picked up a lot of faction crystals, which flying mainly Minmatar ships I don't use a lot. But I do fly the Stratios and Nestor, with an Astero in a hangar somewhere, so I will use them someday. I also picked up a couple of Blood Raider faction modules. But the main prizes were the cerebral accelerator blueprint copies. I found three types of BPCs: Basic, Standard, and Advanced. The Basic flavor of accelerators grants +6 to all learning attributes for 24 hours and each BPC had 5 runs. The 3-run Standard BPCs create accelerators that increase learning attributes by 10 for 24 hours. The Advanced, of which I only had one drop, was a 2-run BPC that grants +12 to all learning attributes for 24 hours. The accelerators, like all drugs, is affected by the Biology skill, with Biology V doubling the duration of the accelerators. Running the Crimson Gauntlet sites was rather simple. I took the Vagabond I use to run tier 3 Abyssal sites, dropped a mobile tractor unit down, and orbited the MTU at 2,500 meters. After destroying all the NPCs present, I would destroy one of the field generators which resulted in two additional waves of Blood Raiders dropping in. Warning for players. The Blood Raiders applied significant neuting pressure, which is why I used my Vagabond. My ship is able to handle the neut pressure from multiple Triglavian ships in a tier 3 Abyssal site. The neut pressure from the Blood Raiders wasn't that heavy. I decided that since the MTU was gathering up the wrecks anyway, I might as well salvage the wrecks. The most efficient way was to run 3-4 sites, then hop in a Noctis and salvage them all up in one run. Each site brought in 1.5-2 million ISK per site. For those looking to produce their own accelerators, running the Crimson Harvest Fields came next. In keeping with the spirit of the season, the layout of the site resembled a pumpkin patch. Asteroids were clustered in five areas, kind of like they are in the Resource Wars sites. Players received 10 event points for every 500 units of the special ore mined. The ore could then be processed to get the minerals needed to make the accelerators. I decided to triple-box the sites, with two characters getting the points for mining and the third character providing Orca support. I discovered I could safely mine three of the five areas, but the last two areas were protected by a rather large fleet that almost put my Orca into structure. I came back with my Vagabond and had to warp off bleeding armor. It wouldn't be until Sunday that I finally got my revenge. I needed a lot of ore, and since I finally had a few hours to play I decided to mine all the ore from a site. I cleared the first three groups of asteroids, then switched over to my mission running duo-boxing combination of a Maelstrom and a Claymore. The Maelstrom dropped a mobile tractor unit to scoop up all the loot and the Claymore drove in to trigger the Blood Raider fleet. Once they started warping in, the Claymore dashed off to rejoin the Minmatar battleship, which in turn was aligning to an asteroid belt, just in case the fleet proved too tough. With the Claymore picking off frigates, the 1400mm howitzers fof the Maelstrom first shredded the neuting curisers, then went to work on the battleships. The frigates that survived the efforts of the Claymore then ran into the Acolyte IIs of the Maelstrom. But it does no good to tackle a ship if the big guns don't survive long enough to apply damage. With the main threat taken care of, I then destroyed the three Blood Raider structures one at a time, destroying the resulting NPCs piecemeal. Once I eliminated the threats to my mining ships, I carefully gathered my fleet back into the site. Keeping two ships in the site at all times, I would warp the third ship of my little gang to the bookmark I placed on the MTU instead of the site beacon. I noticed something strange. In the middle of warp, my screen would go blank for a second or two, then my ship would continue on. Happened for all three ships. I think the cause is that the beacon despawned, a new site spawned, but because I kept ships inside the original site at all times, the game needed to recreate the gate into the original site. Whatever the explanation, I mined the rest of the ore. I shouldn't forget the basic rewards for the event. The long duration accelerator giving +10 to learning stats was available at 50 points, with SKINs for the Astero, Gila, Macharial, and Avatar available at 150, 300, 650, and 1000 points respectively. I had one character get all four, a second get up to the Macharial, and the third the Astero and Gila SKINs. Overall, I'm not sure how much I liked the event. The requirement to mine for hours in order to get the materials to keep my characters in cerebral accelerators was a pain. But the mechanics were interesting and a change of pace. Now on to the next event. I decided to start playing around with Google Alerts in order to come up with ideas about what to write about. While I didn't find any new ideas, I did get a chuckle out of what I read. I probably need to start collecting quotes, because I read some good ones. Here are the articles I received mention of over the last few days of October. The first is an article by James McMahon that appeared last Friday on PCGamesN, titled "Eve Online is like a 'violent Facebook,' and it's changing the world." The article is one of the last covering EVE Vegas and at least EVE players don't come across totally as blood thirsty psychopaths. And CCP Guard came up with a great quote. "Yet, because of how Eve’s community interacts and plots, the data CCP has collected is of massive value to academics who want to understand more about how people organise themselves politically. It’s also of interest to economists who want to do the same with financial systems. 'It’s basically violent Facebook,' Sveinn Jóhannesson Kjarval says, the game’s senior community development lead, as he chuckles. He makes a good point. But, unlike Mark Zuckerberg’s digital-Filofax-for-sale, you can argue that Eve is actually making the world a better place." On Tuesday, Kotaku published a piece by Lee Yancy on the upcoming changes to the war declaration system. 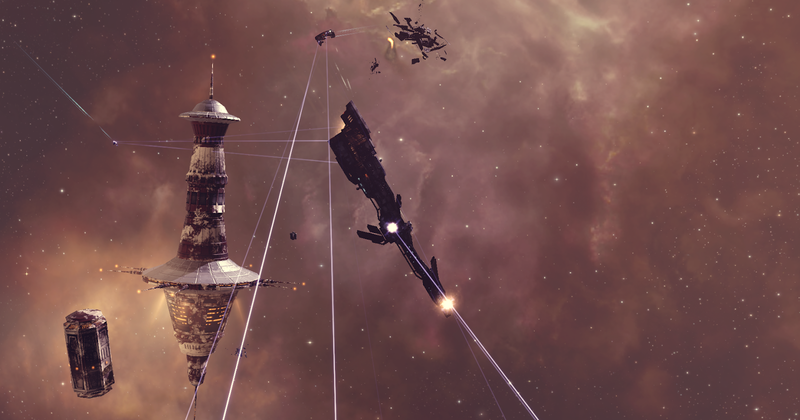 The title, "EVE Online's Constant Wars Are Driving Away New Players", isn't exactly the most inviting, but did mentioned CCP's solution as well as spelling out the problem. "CCP, to its credit, is finally fixing the issue. Last weekend, at the annual EVE Online convention in Las Vegas, CCP shared some of the data surrounding war declarations with the hundreds of players in attendance. It turns out the vast majority of the game’s wars are declared by just five player corporations, seemingly looking to farm easy kills. "CCP has now stated that in EVE’s winter release, corporations that have not built a structure in space will no longer be a valid target for war declarations. This means that players who have formed social groups and have no interest in war nor capability to defend themselves will have a way to opt out of being targeted and hunted into extinction." Halloween saw a pair of articles mention EVE Online. The first, by J. D. Biersdorfer, appeared in the technology section of the New York Times. Tucked away in an article named, "How to Find the Video Games of Your Youth", was this little gem. "Steam has a larger library (and, for $20, access to the Atari Vault of 100 golden-age classics). But both platforms offer games that can be played on Windows and Mac computers. Not all games work on every desktop system and prices vary, but you can find 1990s favorites like Baldur’s Gate for $20, Star Wars: X-Wing for $10 or 2003’s EVE Online for free." Don't let the title of the article fool you, though. CCP is not running a legacy version of EVE and the nano nerf is still in effect. Finally, what would Halloween be without articles about scary video games. PC Gamer had a slightly twisted take, coming up with a list of 10 non-horror games that are scary anyway. Andy Kelly nominated EVE, explaining why with this tale. "I rarely venture into those systems in EVE Online where other players can attack you without immediate repercussions from the space cops, but the first time I did it was utterly terrifying. A friend and I went to a lowsec asteroid belt to mine some ore, aware that these are often the hunting grounds of players looking for clueless people to rob. And, of course, after about ten minutes of mining someone in a much bigger ship warped in and started shooting at us. The ensuing panicky flight back to a safer system had my heart racing more than any horror game. I haven’t returned to lowsec since, and I never will." I was pleasantly surprised by the results and plan to keep up with my reading. My only question is whether, without the presence of a major event like EVE Vegas, can EVE stay in the minds of the press? While in Las Vegas, I not only attended Wilhelm Arcturus' presentation, "Blogging New Eden", but got to hang out with him as well. For those not aware, he is one of the most prolific bloggers writing about EVE Online and his blog, The Ancient Gaming Noob, is not even dedicated to EVE. And he's been at it for a very long time. Whereas I've been lucky to write two blog posts a week over the last two years, Wilhelm cranks out almost one every day. I'm trying to increase my output since I switched my phone service to an unlimited data plan (and saved $25/month!) and use the phone as a mobile hotspot. But Wilhelm's presentation highlighting the decline of the original EVE Blogpack got me to thinking about updating the links on the blog. If I really want to know what people are thinking, I need to have someplace to see what's happening. Apparently someone slipped something into the drinking supply, because the day after Wilhelm's presentation, Blagpuss wrote a post about how many new bloggers attracted by Blaugust had stuck with blogging. We can't credit Wilhelm, though. Gevlon posted about looking for new writers to add to his blog roll. The number of people attracted to blogging by Blaugust and stopped closely aligned with the dropout rate from the EVE Blog Pack. The retention rate of bloggers seems similar to the retention rate of new players in EVE Online. In an age of web sites needing to adapt to mobile devices, blog rolls seem a bit old-fashioned. Combined with feed readers, I imagine not that many people actually visit the blog to see any work I put into curating the lists. So for a couple of years I let the lists go older and staler. A couple of nights ago I updated the feeds to something that makes the feeds look half-way cared for. Maybe sometime in the future I'll wax on about the benefits of blogging. As the internet consolidates, the old networks of blogs fell by the wayside. Too bad, really, given how some of the tech giants act. I've deleted the Facebook account associated with the blog because I just couldn't abide by what I saw happening in Zuckerburg's playground. I can't do the same for Alphabet as my technical needs are too closely bound to Google. As long as I keep everything gaming related, though, I should have no issues. The second presentation of day 1 of EVE Vegas was the EVE Keynote, presented by CCP community manager CCP Falcon, creative director CCP Burger, and game developer CCP Rise. After the last few events, I didn't really expect to hear anything surprising. I was wrong. CCP Falcon started off the presentation with a review of the past year and a preview of the next. Of the items I noted was that the development of Upwell structures is almost at a point where they are feature compatible to the old player-owned structures (POS). 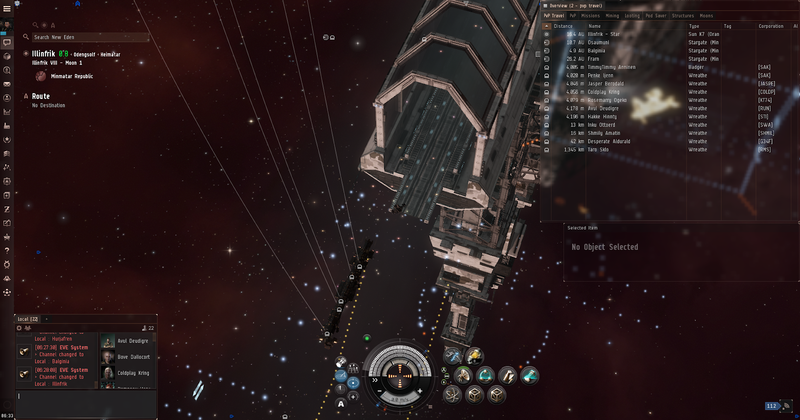 Once the navigation structures are in place, CCP can retire POS. In other structure related news, in the first 9 months of 2018, players had destroyed 6032 citadels, 5216 refineries, and 3155 engineering complexes valued at 26.7 trillion ISK. I'll be on the lookout for some journalist out on the web reporting that players destroyed over $300,000 in structures. Don't ask me what the actual figure is, I have no idea. The next big issue addressed was game performance. CCP is looking to move more services off of the main server cluster and onto different servers. I was too busy taking notes to look around and see the audience reaction. The initial effort to move the in-game chat channels hasn't worked that well. CCP has also experimented with shutting off parts of the bounty system during a large fight to view the effect on performance. No details were given, but I think a large percentage of players would not mind if CCP removed the feature entirely. CCP Falcon also announced that work on a 64-bit client for EVE is almost complete and players should have it in early 2019. Finally, on the hardware side, CCP has purchased 6 new blades, which means Tranquility will have 40 additional nodes to use for load balancing purposes. CCP Falcon also gave an update on the situation in China. Serenity is still off-line as the hand-off from TianCity to NetEase is very ambitious. By ambitious, CCP is rolling the Ascension, Lifeblood, and Into The Abyss expansions, plus all the updates, into the relaunch of the Chinese shard. The goal moving forward is to keep Serenity only one release behind Tranquility. CCP Burger presented next. The first topic concerned Fast Logistical Expansion, or FLEX, structures. The new structures are small, quick to anchor structures that provide a single service and deployable within the weapons range of other structures. The first 3 FLEX structures coming in the November release are cyno jammers, cyno beacons, and jump gates. Perhaps more importantly, the Upwell structures will have achieved feature parity with the old POS system. I'll skip the parts on The Agency and the new activity tracker to get to the elephant in the room: war declarations. Yes, CCP Burger went there, telling the audience that the war declaration system is broken and "needs lots of love." Even though CCP Burger was basically preaching to the choir, brought out some statistics to back up the claim. The first was that 5 corporations declared 50% of all war decs. 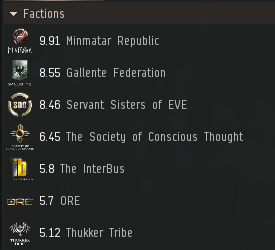 CCP Burger also backed up the claims of "elite PvP" by disclosing those 5 corporations recorded 105 kills per loss. And a statistic that backs up what I've said for years is that only 4% of wardecs result in the defender registering a kill. But, the wars become bloodier if the defender owns a structure, with the number of kills in a war increasing from .034 kills per war to 1.655 kpw. Those wishing to see war declarations ripped out of EVE entirely will be disappointed, however. Ripping out the system just transfers all the problems to other game systems, so some form of war dec system will remain. 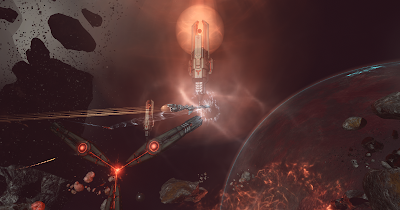 CCP plans to alter the war declaration system in two phases. In the first phase in December, a requirement for the presence of Upwell structures will come into play. The final implementation is scheduled for sometime in the first half of 2019. Skipping past the upcoming event in December featuring atmospheric flight, up next was CCP Rise to talk about Abyssal deadspace and the Triglavians. The feature worked well, but had a high barrier to entry as most players running the Abyssal sites have played for over 5 years. While the deadspace sites have a reputation for difficulty, 97% of players going into the sites come out the other end. Still, that's a much higher death rate than missions, in which fewer than 1% of players die. As part of making the content more accessible to lower skilled characters, CCP is introducing multi-player sites. The new content will allow three players flying frigates to run the sites, with the drops scaling up to make running the sites worthwhile. 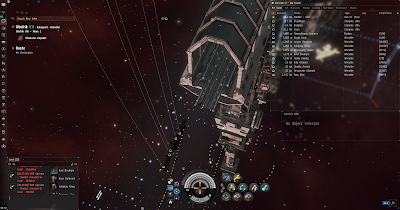 Finally, CCP is introducing PvP to Abyssal deadspace. The possibility will exist to enter a special dungeon that leads to an octagonal arena where players can fight over special loot. Two players will enter, but only one leave. In terms of ships, CCP Rise announced that the Triglavian's will receive four new ships, including the first tech 2 pirate ship. The new destroyer sounds like a kiting ship. Looking at my notes, I just wrote down that the new battlecruiser should be nasty. Rounding out the Triglavian ship line are tech 1 and tech 2 logistics cruisers utilizing the same ramp up mechanics for repairing that the Triglavians use for dealing damage. Those are the highlights from the EVE Keynote address at EVE Vegas this year. The presentations on the last two days were spent fleshing out the information provided on the first day. The post is a bit late due to my playing EVE too much since getting home from the gathering. So that's a good sign of how I feel about the game now, right? I got back from Las Vegas last night and finally feel human again after scarfing down some Taco Bell for lunch. I fully intended to start my write-up of the EVE Keynote from EVE Vegas but decided to do a little web surfing first. I stopped by The Ancient Gaming Noob and, "Holy Cow! ", Trion Worlds was purchased by Gamigo. All reports indicate over 80% layoffs as a result, as Gamigo immediately cut all but 25 members of Trion's workforce. At this point I recommend reading Wilhelm's excellent piece on the buyout. He did the deep dive into the financial structure of Gamigo so I don't have to. I am going to copy/paste a required financial discloser release because I found something interesting. Your mileage may vary. gamigo AG: acquisition of Trion Worlds games company to further strengthen its market-position in the games market. Hamburg, October 22, 2018: gamigo AG ("gamigo Bond" WKN: A2NBH2 / ISIN: SE0011614445) has acquired major assets from Trion Worlds Inc. Trion Worlds is a leading US gaming company with offices in Redwood City (California) and Austin (Texas) and has as publisher and developer of online and console MMO-games, well-known games such as Rift, Defiance, Trove and ArcheAge in it's portfolio. The assets of the company have been acquired by gamigo's subsidiary Golden Gate Games Inc., via an "Assignment for the Benefit of the Creditors" process, in which the buyer only buys those assets, with which he wishes to continue the business. The gamigo group has acquired the majority of the assets, including the platform, takes over employees to operate the business and gets the full publishing rights of the games. The IP's of the Trion Worlds games have been acquired by gamigo's sister company Padmapani GmbH and are made available for gamigo group, worldwide and exclusive. Since its foundation in 2000, gamigo has developed into one of the leading publishers of free-to-play online and mobile games in Europe and North America. In total, the gamigo Group employs more than 250 employees at its headquarter in Hamburg and branches in Berlin, Münster, Darmstadt, Cologne (Germany), Warsaw (Poland), Istanbul (Turkey), Chicago (USA) and Seoul (Korea). The company's core portfolio includes successful gaming titles such as Aura Kingdom, Desert Operations, Dragon's Prophet, Echo of Soul, Fiesta Online, Goal One, Last Chaos, Shaiya and Twin Saga. gamigo grows via organic growth as well as through acquisitions and has made over 20 acquisitions since 2013, including games, media and technology companies as well as individual game assets. Curiosity got the better of me and I decided to look up what "Assignment for the Benefit of the Creditors" actually meant. I wound up landing on the blog of a bankruptcy lawyer from California. The Gamigo purchase wasn't due to ansy investors. Instead, Trion flat out couldn't pay its bills. An Assignment for the Benefit of Creditors is the state version of Chapter 7 bankruptcy, perhaps better known as liquidation. ABCs are a state law, rather than a federal law, concept. They have been used in California for almost a hundred years. In an ABC the business hires someone to liquidate the assets and distribute the proceeds to the creditors. The business assigns the assets to that person for that purpose. The assignee then serves as a sort of private “Chapter 7” Trustee, and has a fiduciary obligation to maximize the liquidation proceeds. One fundamental difference between Chapter 7 liquidation and an ABC is that an ABC usually does not involve any court – state or federal. The result is that an ABC is a more streamlined process that takes less time to complete than a Chapter 7 bankruptcy. Thus, while the net effect is frequently the same in both processes: the business is liquidated and ceases to exist, the time involved can be significantly less in an ABC. Another difference is that in a Chapter 7 the creditors have very little, if any, input in the process, whereas in an ABC the creditors have to agree to the results beforehand for the process to succeed. The other bit of information was the purchase price. We actually have a recent sale with which to compare the Trion sale. Less than two weeks ago, on 12 October, the sale of CCP Games to Pearl Abyss finalized. In that transaction, Pearl Abyss agreed to pay $225 million upfront, with up to an additional $200 million in deferred performance-based payouts. The potential $425 million deal is in start contrast to the "low USD two-digit million amount (including possible earn-outs)" quoted in the financial release announcing the buyout of Trion. In truth, I did not play Trion games, so I can't really claim an emotional attachment to the game company. I played Rift at launch but never made it to level 25, and Defiance up to maybe level 10. But I do remember Scott Hartsman from his time working on Everquest 2 and wish him luck wherever he winds up, although I hear that is not a popular sentiment at the present time. As I normally do at a player meet-up like EVE Vegas, I've looked at the schedule and determined the which presentations I want to see. I fully expect, like most years, that I will fail to stick to the plan. But once again I'll post what I originally plan on observing. Friday - All the big news coming out of EVE Vegas this year will come from today's presentations. Today's presentations could be delayed due to CCP's equipment getting caught up in U.S. Customs. 14:00 PDT/21:00 EVE: Opening Ceremonies and CCP Presents. Anyone looking for news about Project Nova (the FPS followup to DUST: 514), EVE: War of Ascension (the mobile game who's alpha debuted at EVE Vegas 2017), Project Galaxy (the ARG being developed by NetEase for the iPhone), and the undisclosed MMO utilizing the Unreal 4 engine should definitely make sure to watch the first presentation. 16:00 PDT/23:00 EVE: EVE Online Keynote. The scheduled speakers are creative director CCP Burger, community manager CCP Falcon, and game designer CCP Rise. I expect to hear about the final phase of the implementation of Upwell structures and the final removal of POS from the game. I also expect to hear more about developments in PvE, especially Abyssal sites. I also expect to hear some mention of news about UI changes like The Agency as well as the activity tracker. Saturday - Tomorrow has good, but not critical to see content. Also, with two presentations in each slot, I managed to fill up all the slots with something to watch. Yes, contrary to popular opinion, some of us do come to Las Vegas for the EVE content? Why come to such a depressing place otherwise? 11:00 PDT/18:00 EVE: Upwell Structures: The Future. I fully expect CCP Lebowski to tell us the end game of the Upwell structures development roadmap. Also, given some of the way citadels have affected New Eden, we may see details of upcoming balance changes. A possibility also exists that CCP Lebowski could let us know of future plans involving NPC owned structures and stations. 12:00 PDT/19:00 EVE: The Continuum of War: 2016-2018. Matterall (I know Matterall, btw) will give the followup to his EVE Vegas 2017 presentation, this time covering major null sec conflicts from The Casino War to today. 14:00 PDT/21:00 EVE: Project Nova: The Future. CCP Rattati will present "an in depth look at the future of Project Nova, the game play, and the aspirations for a first person shooter set in New Eden." I don't play first person shooters, but as the presentation pertains to some of the biggest news coming out of EVE Vegas, I'll just pick up a quick slice of pizza and not take an extended lunch. 15:00 PDT/22:00 EVE: Ships and Balance. CCP Rise will talk about upcoming plans for ships. I don't expect anything earth-shattering, but then again I don't fly in null sec. The presentation may disrupt the PvP meta and shape the market for months to come. 16:00 PDT/23:00 EVE: Blogging New Eden. Wilhelm Arcturus of The Ancient Gaming Noob will make the case for blogging in the age of social media. Blogging? Who does that? (I know Wilhem, btw). "Alts don't just have to be mules, cynos, and eyes. We'll discuss how to create a viable gang with multiple characters, multiply the effectiveness of a larger fleet, and accelerate income generation." Sunday - I'm a bit torn about the final day of EVE Vegas. Is it filler because for many Sunday is getaway day plus Sunday morning may resemble the zombie apocalypse? Still, I plan to attend the following. 11:00 PDT/18:00 EVE: Introducing the Activity Tracker/CSM Roundtable. I really want to see a preview of the new activity tracker, but at the same time want to see what shenanigans the CSM are up to. 12:00 PDT/19:00 EVE: How To Lead Without Being CEO. Brave's Dunk Dinkle gives "A brief talk on leadership, when you are not CEO or officially in charge of the group. How to step up and help without relying on rank or screaming at people." I'll probably take an extended lunch and come back for the 3pm presentation. 15:00 PDT/22:00 EVE: Events and The Agency. The final content presentation by CCP, I am not a big fan of The Agency, but I do like the live events, so I will definitely show up to this presentation. 17:00 PDT/midnight EVE: Closing Ceremonies. The closing ceremonies don't often have a lot of news, but the dates of upcoming events like next year's Eastern North America and EVE Vegas may be debuted. That's it for now. I need to go out and get a pad of paper and some orange juice before the presentations begin. I may even blog over the weekend, depending on how exciting the presentations are over the next few days. I arrived last night in Las Vegas for my 4th EVE Vegas. Four years. The place is still pretty depressing, especially in the early morning light before the wreckage is cleaned up to start a new day, but I'm here for the EVE nerds, not the high-rolling Vegas lifestyle. As I sit in my room before 8am, sipping on a Starbucks venti latte and typing this post, I can say things are going 100% better than last year. First, the ride from the airport. Last year, I took a shuttle bus from the airport to The Linq, the casino I'm staying at. What is a 10-15 minute trip by taxi turned into a 45-minute ride. So this year, I spent a little extra and spent the money on a cab. Yes, I spent a bit more, but the time saved was worth it. I think an industrialist would call that an opportunity cost. Next, the room. Or perhaps more critically, my room's location. Last year, I had to take the elevators farthest from the check-in desk and casino. This year, I'm in district 1, using the elevator bank closest to the check-in desk. I suspect I won't have the same aggravating issues getting to and from my room. Speaking of aggravating, last year I couldn't get a cell phone signal in The Linq. If I wanted to use my phone, I needed to step outside the building. Not this year. Last night when I checked while sitting at the main bar, I got a strong signal. I'm not going to try to log into the local wifi. I have an unlimited data plan now, so I'll just use that. I almost matched my alcohol consumption from last year in my first night in 2018. My normal standards, my two beers isn't a tremendous amount to drink. But last year, I only drank a couple of shots of Tito's at the Open Comms show broadcast on Thursday night and 3 drinks at the party at Drai's. I'm well on my way to excceding that mark. Speaking of Open Comms, I made it down to 3535, the main bar in The Linq, and ran into Dreydan and Dirk & Mrs. MacGirk, as well as a host of others like RoAnnon and Random McNally. Dirk might not remember seeing me, as he looked like he'd been drinking all day. Last year, the place was packed and I never ordered a drink. I kind of expect as the rest of the EVE Vegas crowd rolls in, the same will be the case as trying to get the attention of a bartender gets a little difficult. I will mention that the hot EVE topic so far was the war declaration system. While I don't expect to hear any news about war declarations in the CCP presentations this weekend, I do figure to hear some rumors. Plus, I expect to talk about the subject a lot more in the days to come. One of the big issues, if not the biggest issue, coming out of the first CSM 13 summit in Reykjavik was the state of the war declaration system in EVE Online. In my blog post on Tuesday, I pointed out two key passages from the summit minutes. I'll repeat them here. "In the EVE Leadership meeting the CSM was presented with numbers resulting from research into the state of war declarations in EVE and those numbers quite starkly showed how asymmetric the situation is, and how war declarations allow a small number of players to negatively affect a huge number of people, with low risk. These numbers may be discussed further by CCP at a later date." Everyone seems to have an opinion on the subject. The mechanic is such a long-running, open sore on the game that I broke down three years ago and worked out a different system. I think my proposal is a bit too complex and would take up too much development time to implement, but I still like some of the core assumptions I made. Instead of attempting to come up with a brand new proposal, here are some core concepts I'd like to see in a War Declarations 2.0 system. General theory - In the current system, war dec corps and alliances tend to camp certain systems. The war dec play style reminds me of street gangs standing on the corner more than anything else. So mold the new system around years' worth of demonstrated behavior. If the system elevates our current street gangs into mafioso running protection rackets, so much the better. Limited geographic scope - The current war dec system never made much sense to me in a lore perspective. An Amarrian corporation could bribe CONCORD to allow it to fight Matari corporations inside the Minmatar Republic? Madness. At the very least, a new war dec system should not allow war declarations to extend past an empire's borders. If players want cross-border conflict, they need to declare two war decs. I also believe in internal conflict within each empire, with competing regional interests competing with each other. We have that with the Amarrian royal houses, Minmatar's tribal structure, the competition betwen the Caldari mega-corporations, and whatever is happening in Gallente space. To reflect that conflict, I would like to see war decs limited to a single region. The war dec flag - In keeping with the spirit of player groups fighting over space, ownership of a structure like a citadel or refinery in the region of space the war dec occurs in should be a requirement for participating in a war dec. Don't want to become involved in a war dec? Don't put up a structure. Simple, right? Added incentives and costs. In my original 2015 proposal, I had corporations paying NPCs for immunity. Since I now would like structures as a requirement, let's make everyone's life easier and impose a tax instead. Impose a special 1% tax on all bounties and mission rewards in high sec. Once a month, distribute that tax to the owners of citadels in high sec. But split the tax revenue based on the system the taxes are collected and the location of citadels. For example, Lanngisi is a mission hub for running level 4 Sisters of EVE missions. In a given month, perhaps 4 billion ISK in special taxes are collected. If two corporations owned structures in Lanngisi that month, then each of the corporations would receive 2 billion ISK. Costs of war decs. The cost of a war dec would remain as is, despite the fact the amount of high sec systems affected by a war dec is reduced from 23 Empire regions down to 1. 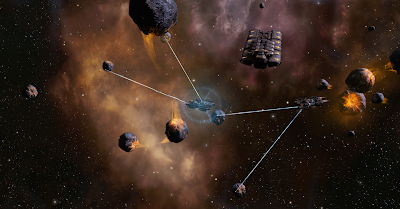 The change would have the effect of tripling the cost of war decs targeting the systems surrounding Jita, as Sobaseki is located in Lonetrek and Muvolailen in The Citadel. Assuming, of course, that the defending corporation/alliance has structures in all three regions in order to allow the attacker to declar war in all three regions. Ending of the war. Wars should end in one of five ways. 1. One side loses all structures in the region. 2. One side surrenders to the other. 4. The attacker fails to kill a ship during the week AND fails to either reinforce or destroy one of the defenders structures. 5. The attacker fails to renew the war declaration. Failure to perform penalties for the attacker. One of the problems with the current war declaration system is that the wolves thin the sheep herd way too much for long term stability of the game. War is serious business, and the consequences of launching a thoughtless war should reflect that. My inspiration comes from the cult classic The Warriors and what happens to Luther and the Rogues in response to Luther's killing of Cyrus and failure to pin the deed on The Warriors. Honest failure has a price. But if the failure is a result of issuing troll war decs? Well, CONCORD and the empires have memories. Here are the penalties for poor or lazy performance during a war dec for the aggressor I would like to see in a new war dec system. 1. Failure of the aggressor to kill a ship, reinforce a structure, or kill a structure results in the loss of the ability to issue new war declarations for one week, with the penalties being cumulative. So, for example, if a corporation declares 10 wars, but fails to kill a ship in three of the wars, the corporation (or alliance) would be banned from issuing war decs for three weeks. If, the following week, the aggressor fails to get kills in 2 of the remaining 7 wars, two additional weeks would be added to the total, meaning the corporation could not declare new wars for 4 more weeks. 2. The attacker disbanding the corp or alliance results in each individual member picking up a one week inability to declare war declarations, which transfers to the new corp/alliance which then accepts the player's membership application. Also, if the disbanding corp/alliance had an existing ban on it for making war decs, that amount also transfers with the player. However, that amount is not cumulative. For example, if a player leaves a corp due to disbandment, and the corp has a 1 week ban on declaring war, then if joining a corp with a 2-week ban, there would be no additional penalty to the accepting corp.
3. There is no penalty for surrendering. The defending corp/alliance would probably accept a shortened period of war. No sense in creating mechanics that would artificially extend the fight. Plus, if the attacking corp wants to pay the defending corp money to avoid one of the above penalties, that seems fair to me..
Limits on war declarations. I wouldn't put a limit on war declarations if the above suggestions were put in place. The penalties and geographic limits to war decs are designed to naturally discourage the widespread issuing of war declarations. If a corporation declares 100 wars, and in 50 the aggressor fails to kill a single ship, that's basically a one year ban on declaring new wars, transferable to a new accepting corp/alliance. I think that's disincentive enough to keep the war decs limited in number. I like my original idea from 2015 better, but can one make a business case for something that complex? I think implementing this simpler outline would be easier, but with the existing legacy code, who knows? Still, I've now thrown my two cents into the discussion. Let's see if CCP announces anything about war decs at EVE Vegas.